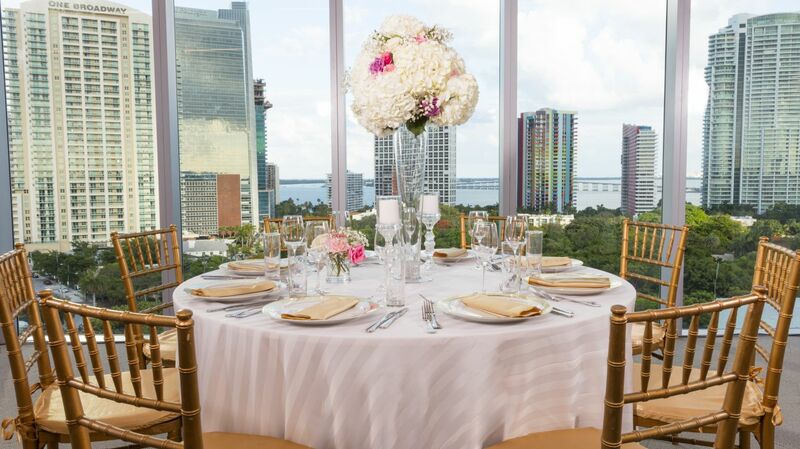 Discover your dream wedding at Atton Brickell Miami. Featuring 5,000 square feet of beautifully appointed event space, our Miami wedding venues provide an ideal backdrop to your special day. ** Take a look at our Meeting Fact Sheet to learn about Atton Brickell Miami's meeting capabilities. Host the perfect meeting or social gathering in the spacious Brickell Ballroom. Featuring soaring 18-foot ceilings and 2,226 square feet of space, the versatile Brickell Ballroom is ideal for everything from corporate conferences to large celebrations. Found off of our largest event venue—the Brickell Ballroom—the Brickell Ballroom pre-function space offers guests 1,041 square feet of space. Able to be booked on its own or with the Brickell Ballroom, this event space in Miami is able to suit a variety of event needs. The Skyline Ballroom features ample natural lighting, 2,070 square feet of space, state-of-the-art audio-visual equipment, access to pre-function space and our rooftop pool, the Skyline Ballroom will make the perfect backdrop to your special event. Elevate your next business or social gathering on our rooftop pool deck. Guests will be in awe of our stunning views of the downtown Miami area. Enjoy 1,500 square feet of space, convenient amenities and services, and well as on-site catering options.